LITTLE SAVAGE: I just saw the movie “The Secret”. It’s message seems to be that thoughts are the most powerful things in the Universe. So….If I think the right thoughts, will the Universe align itself with me, and everything I want will fall from the sky? If I really feel it and think it, will that shiny new Tesla arrive in my driveway free of charge? Would this mean that Everything and Everyone are mass hallucinations of each other’s thought processes creating the Universe each according to her/his own reality? That works for me! I am a cartoon. In my multi-universe, I can have anything I want; anything can happen on the page. If I fall off the edge and crash, I pop right back up, intact and whole. I don’t know how it works; it just is. I’m simply the outward expression of my creator’s thoughts. That’s the beauty of being a cartoon. SAVAGE CREATOR For those of us who are NOT cartoons, here are a few NOT-so-secret pieces of wisdom. If you find the love in your work and you do the work, the possibilities open up. Thoughts are powerful things: your attitude, sense of purpose and resilience do matter. Small successes build upon each other,. Mistakes are simply part of the learning curve and are often the best teacher. Redefine your work, play and embrace it. Love it. Love it Love it. . The more present you are, the happier you are. Everything is NOT your fault (nor the other person’s). Leaping tall buildings in a single bound is for super heros and cartoons. It does happen occasionally. The more you are willing to do for your dream, the greater the possibility you will make it come true, with a little help from your friend the Universe. Ask not what your dream can do for you, but what you can do for your dream. The “how” tends to reveal itself if you’re paying attention and doing the work. “WORK?! !” Is that idea going to sell? Don’t get me wrong. There’s nothing wrong with having the “good life”. Give us this day our daily bread, roof, health and needed implements. 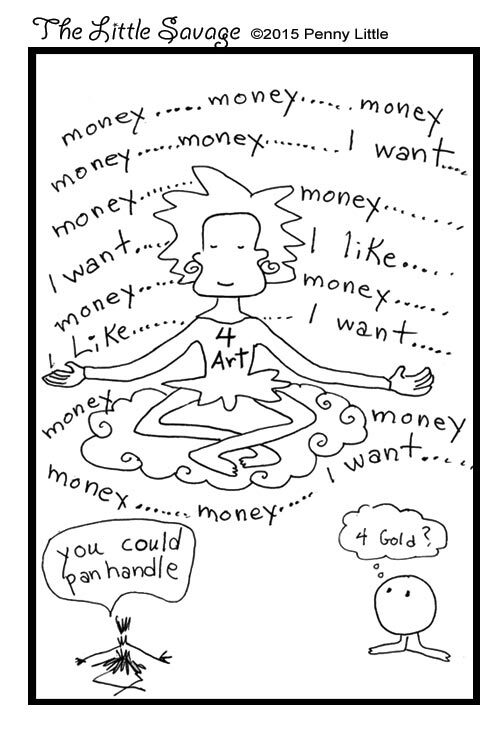 But, if it’s more things you want, rather than the good you can do with your abundance, think about that for a minute. Aren’t things just part of the clutter? Ever see the “Story of Stuff”? Things are only good if they’re being used for something good. Accumulating things for the sake of it, or because you want the hottest new car because some advertiser sold you on it . . . . what is that? WHY do you want it? What will you use it for? Your ego gratification? Ever hear of GREED or wanting more than you NEED. What about ENOUGH? Is it really all about YOU? What about US? Is your dream about stuff and fluff, or is it bigger than that? End of transmission. I have moved my blogging from Blogger to here as I get ready to launch my 6 books, as ebooks, mini books and maxi books. I have been reconstructing my website and getting ready to take this show on the road! Hope you’ll come along with me!